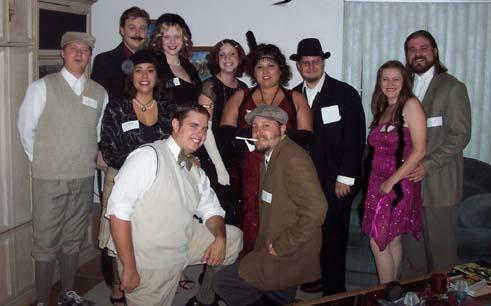 The Final Curtain is a freeform 1920s murder mystery party game published by Murder Mystery Games Ltd for 7 to 20 guests - plus the host (who plays Jay Fitzharing). In The Final Curtain actor Vincent Royle dies mysteriously on stage - and Scotland Yard believes it's murder. However, the show must go on and the next night the Littledean Theatre Company are called together to celebrate Vincent's life and also to answer questions posted by Inspector Blewitt. As a member of the cast or crew, you will find yourself in the middle of treachery, blackmail and murder. It will be up to you to wheel and deal with the other guests. Can you achieve your goals, keep your secrets hidden and uncover the murderer? The Final Curtain lasts for about four hours and is suited to an evening. It is often played over a meal - a finger buffet is possible to allow guests to circulate and talk in private. The host reads the game - and they also play Jay Fitzharing. It is possible to host The Final Curtain without knowing who the murderer is (but personally I prefer to know so that I can cast accordingly). 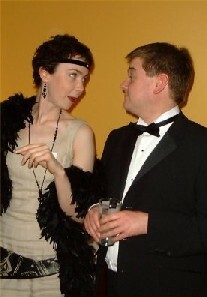 On the evening, the guests are met by Jay Fitzharing, the owner and manager of the Littledean Theatre. They then receive their detailed backgrounds - including dark secrets, objectives and money. The fun then begins as everyone questions, bribes and blackmails each other - and tries to find out who murdered Vincent Royle. However, the murderer hasn't finished and before the night is out he or she will claim one more victim. Finally, everyone has the chance to make their accusations of who killed the Vincent Royle before Inspector Blewitt reveals all. The Final Curtain is available from Murder Mystery Games Ltd and costs $37.99. Purchasing The Final Curtain is simple. Connect to the Murder Mystery Games Ltd website and follow the instructions! You will then receive information on how to download the main file almost immediately. Just download the game, print it out and have a great murder mystery! And please remember that if you buy The Final Curtain you are buying it from Murder Mystery Games Ltd (the publishers). Don't forget to read their terms of trade.